The Kember family’s 14th annual Gleneith Border Leicester Stud on property sale held at “Gleneith Park” Ganmain was a strong representation of the current sheep market. With a slight increase on last year 89 superborder rams averaged $1640 with a top price of $7400 from the 100 rams offered. The Kember family have had a long commitment to breeding Border Leicester sheep stretching five generations right back to 1922. Under current management they are committed to providing the best sheep they can backed by accurate lambplan data. “we are committed to lambplan, submitting quality data to get the most out and that’s why buyers are choosing Gleneith” principal Wes Kember said. “We are focused on milking ability, growth and fertility measured by number of lambs weaned as they are the profit drivers in our business. “I have never known someone to go broke while increasing profit” Mr Kember said. The $7400 top price ram was the number one Border Leicester cross (BLX) indexing ram of the sale as well as being in the top five per cent of the breed for maternal weaning weight (Mwwt), weaning weight, and post weaning eye muscle depth (Pemd) and top 10pc for post weaning weight. He was sired by Gleneith 275-14 and purchased by Johno’s Border Leicester stud, Eurack, Victoria. Johno’s purchased a second ram for $2500. Also sired by Gleneith 275-14 the second top price ram was in the top 10pc of the breed for Mwwt and number of lambs weaned, top 1pc for Pemd, and top 2pc for BLX index. He was purchased by Deepdene Pastoral, Kyemba, for $3500. Coolamon producers AI & KM Exton led the volume buyers loading nine rams for a $1956 paying to a top of $2300 twice. A & C Cummins, “Easedale”, Coolamon, also purchased nine rams this time for a $1456 average peaking at $1900 on two occasions. 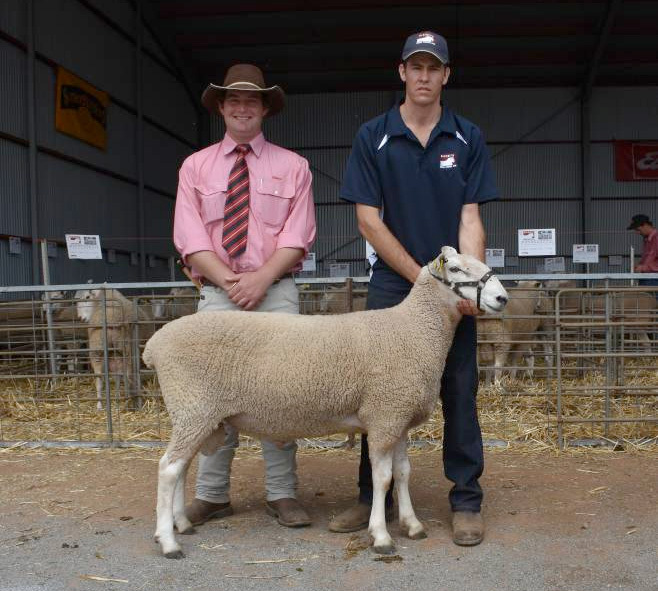 Moama grower Everdry Pty Ltd selected eight rams paying to a top of $2000 four times to average $1850. While both Boomi Pastoral Company, Albert, and Burgess Hill Pastoral Company, “Burgess Hill”, Coolamon topped at $2100 on their way to purchasing eight rams averaging $1400 and $1300 respectively. The auction sale was conducted by Elders Rural Services with Joe Wilks and Will Stoddart the auctioneers.